Berwick's Lee Hamilton suffered a neck injury at the weekend and was taken to hospital. Arbroath closed the gap on second division table-toppers Forfar to only one point with a 2-0 win at Berwick. 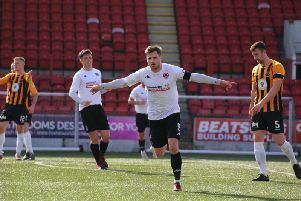 Goals from Steven Doris, with a first half penalty, and Martin Scott, saw the Smokies boost their title hopes, taking advantage of the leaders’ 1-1 draw at Elgin. But for Ranger’ fans, it was a case of waiting to hear on how full-back Lee Hamilton came through a nasty injury scare. There was an eight-minute delay in play at the start of the second half before Hamilton was stretchered off and taken to hospital with a suspected neck injury. Berwick, after picking up only one point from their last two games, welcomed back Michael McKenna after a three-match suspension. But after a heavy downpour just before kick-off, the opening exchanges were frantic with Ryan McCord shooting wide for Arbroath. Greg Rutherford then slipped the ball through for Darren Lavery to run on to, but visiting keeper Ricky Gomes was quickly off his line and smothered the danger. From a neatly worked free-kick Rutherford pulled a shot wide, and Gomes was back in action, getting down to deny Aaron Murrell after Rutherford headed across goal. At the other end, Lee Hamilton had to make two covering tackles in quick succession, but in general the first half was devoid if any real quality and goalmouth incidents were few and far between. A period of Arbroath possession resulted in former Berwick player David Gold shooting wide under pressure. In the 37th minute, Arbroath were awarded a penalty when Kevin McKinlay was harshly adjudged to have fouled Bobby Linn and Doris broke the deadlock when he netted from the spot, sending Sean Brennan the wrong way. Straight from kick-off at the start of the second half, there was a lengthy delay when Hamilton received medical treatment after landing awkwardly and was replaced by Jonny Fairbairn. On the resumption Linn broke down the left and his shot was saved by Brennan and less than a minute later the ball was played across the face of the Berwick gosl, but two Arbroath players sliding in were unable to get a touch. In the second minute of injury time Arbroath made the game safe with a second goal, Scott running on to a through ball from Doris, which he slid underneath the advancing Brennan. Berwick: Brennan, Hamilton (Fairbairn 54), McKinlay, Notman, Scullion, Spark (Verlaque 64), Thomson, Lavery, Rutherford, McKenna, Murrell (Phillips 68). Arbroath: Gomes, Gold, Hodge, Little, Hamilton, Whatley,Malin (Kader 79), McCord (Smyth 71), Doris (Prunty 93), Scott, Linn.